Dies ist ein modernes Apartment mit 1 Schlafzimmer und 2 Bad im Herzen der Innenstadt von Greensboro. Zu Fuß zu Dutzenden von Restaurants und Bars, dem Baseballstadion und dem Performing Arts Center (derzeit im Bau). Komplette, gut ausgestattete Küche mit Geschirrspüler, Mikrowelle und Kühlschrank. Waschmaschine und Trockner vor Ort. Zweiter Stock mit nur Treppenzugang. Voll möbliert wie in Bildern angegeben. What a great place to stay! We stayed here only one night but we would definitely love to stay here again if we ever return to Greensboro. It is roomy and beautifully decorated and provides all the comforts of home. It’s in a perfect location within walking distance of museums, good restaurants, and the theater. Stu, the owner, was helpful and got back to us right away to answer any questions. 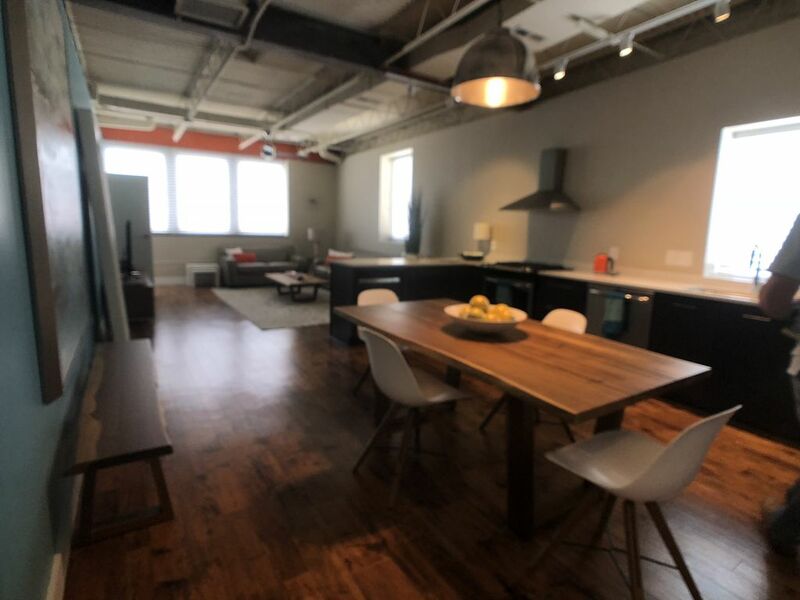 We highly recommend this wonderful loft apartment!!! We loved our stay in Greensboro!! The loft is beautifully decorated and has a great location!!! The owners were kind and easy to work with. We definitely recommend !!! Fabulous surprise in downtown Greensboro. The loft is charming. Very big and everything has been thought of. We came to G'boro for a most unfortunate event, a funeral however, Stu and his immediate attention to my emails help make this trip a pleasure. My last minute plead for finding a place was answered quickly and comprehensively although the VRBO site made a mistake in the availability, he clarified and help me through the process. The condo is centrally located in downtown and surrounded by Elon Law school. With this campus brings the added amenities of super cool restaurants and pubs as well as a mini Organic market called Deep Roots Market. All within walking distance. Also within walking distance is the newly built minor league baseball stadium which, if we had the time, we would have truly enjoyed to take advantage off. A real "Bull Durham" experience...probably dating myself now. Anyhow, the place very easily accommodated 4 of us, 2 adults and 2 teenage boys, 15 and 16. GREAT smart TV, 2 full baths and very state of the art kitchen. If in G'boro, this is the only place to stay. enjoy it as we did....thanks Stu. Lovely, modern & private apartment reasonably priced. 10 minute drive to the Coliseum. Walking distance to restaurants/bars. We wish we could stay longer... maybe next time! Thanks, Stu! Thank you so much Lora. It was a pleasure having your as our guest. Please come back soon. You're always welcome.